Your password can be any combination of characters and numbers (international keyboard symbols cannot be used). Yes, you have agreed to our license agreement. This information is stored by PayPal and billed recurringly. The Latest: Easy-to-use web applications. A demonstration of their use is available here. The Original: Full-featured IP Protector desktop software available here. A demonstration of its use is available here. The Toolkits: For software developers. You can create a free TEST account instead. There is a 30-day refund policy if you are not satisfied with, or able to use, the e-TimeStamps you purchased. e-TimeStamps are strong, independently verifiable evidence of data's existence and state at a specific point-in-time. You will keep your unaltered file and its timestamp. Strong legal evidence produced by audited systems with hardware certified FIPS 140 level 3 or higher. 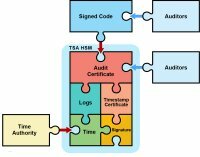 Audited logs from trusted systems linking your data to US & EU time. +/- 1 second with > 99.99% uptime. A detailed description of the SecureTime system is available. Your personal information is encrypted before it is transmitted over the Internet. We use a standard and secure SSL technology.